THE INFLUX of different versions of Pascal for the Spectrum and QL has certainly made the language more popular with micro-computer enthusiasts and a good book on the subject is essential. Surprisingly enough, one of the best books was written two years ago and creates a novel approach to the language. Elementary Pascal, by Henry Ledgard and Andrew Singer, may seem an uninspired title for a book but the subtitle, Teach Yourself Pascal by solving the mysteries of Sherlock Holmes, gives some clue as to the tack that the authors follow. After a brief preface in which an old manuscript containing some forgotten notes, written by that eminent GP Dr Watson, are discovered, the book launches into the first escapade involving Sherlock Holmes. He discovers the Analytical Engine, which we would call a computer, and shows Watson how it can be used by a criminologist to collate facts and render clues more helpful. Holmes does not see it as a miracle machine which can solve cases but as something that will be useful in proving that his conclusions are correct. "Of most interest to me is that it will provide a way of expressing my logical methods in a rigorous form, and perhaps be useful in communicating to others my modest attempts at formulating a Science of Deduction". Indeed it does. The explanations given by Holmes, followed by the notes of the authors, combine to produce an excellent, stimulating and amusing text which provides at least a basic grounding in the main Pascal subset common to all versions of the language. The main section of the book is used by Watson to discuss four cases in which Holmes used the Analytical Engine. The first, Murder at the Metropolitan Club, deals with algorithms and shows how ideas for programs can be written down in the systematic way required by the Pascal programming language. Holmes finds the murderer by fitting clues together within a computer environment and then looping around the program instructions until one clue fits with another and the villain is found. The remaining cases build on the knowledge of Pascal that the first gives. In the Adventure of the Bathing Machine, Holmes enters data about sea tides in order to find the time of a murder and trap a murderer; A Study in Cigar Ash shows how Holmes teaches Watson how to enter data into the Analytical Engine using Pascal and how that information can be accessed; and finally, The Adventure of Clergyman Peter finds Holmes trapping a religious thief with the aid of a train time table and the Analytical Engine. Once the main body of the Pascal language has been introduced Holmes indulges in a series of three pipe problems. Those are simple cases which show how useful application programs can be written in Pascal. The programs grow more complex but the real authors of the book continue the notes with which they back up all of Holmes' cases. Those notes seem to be for people who have not followed the famous detective's thinking. Despite its unorthodox approach, Elementary Pascal should help even the most accident prone potential programmer learn the language which is growing more popular all the time. The book's style is somewhat similar to that of Conan Doyle and Holmes is a reasonable counterfeit. THE REALLY Easy Guide To Home Computing, by Sue Beasley and Ruth Clark, adopts the discovery led method of learning. There are lots of cartoons and funnies interspersed throughout the text to aid the user, based on the characters of Mike and Rose and Inspector Key. Those characters at times can be a little overwhimsical which, in a way, detracts from the text. It has to be asked, however, whether yet another book on learning Basic is necessary. Learning Basic at all is considered in some quarters to be inferior to learning Logo as a first programming language at nine plus. As The Really Easy Guide to Home Computing is aimed at that age-group, it would seem that it could be superfluous on two counts. FEW PUBLISHERS have ever considered launching books about machine code on the QL or how to get the most from QDOS. While some have been capitalising on the power of the SuperBasic language others have just been worried whether the operating system will change or about how to treat the information. Neither of these worries has hit Adder Publishing which has just launched The Advanced QL User Guide by Adrian Dickens. It contains just about everything that both software houses and the private individual require to launch into machine code programming. When taking the first steps towards QDOS mastery the reader is introduced to a SuperBasic program called the Experimenter which will allow many of the 68008 registers to he changed. It also allows the beginner to see the results of QDOS routines, and how they will affect the running of the QL. Dickens suggests several experiments including suspending the operation of SuperBasic and printing a character on the screen. The Experimenter is limited in its appeal but the author soon progresses into machine code manipulation of QDOS, giving a full list of QDOS utilities available and the traps required to invoke them. 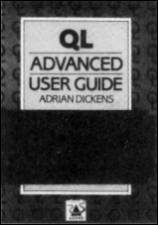 Despite the sometimes convoluted style and the exorbitant price, The Advanced QL User Guide acts as an excellent reference book as well as a tutorial. It is a stepping stone into the heart of the QL. ANYONE caught giving away the trade secrets of an industry would normally be regarded with suspicion by co-workers in that field. The culprit in this case, A J Harding with his book Writing Software For Profit, is, however, likely to be blessed by colleagues in the software industry and amateur programmers who want to get their ideas into the shops. The book, published by Virgin Books, not only shows how to approach the business side of the operation - going to software houses, writing specific application programs and dealing with income tax - but also describes the ideas behind the industry, which types of programs are likely to be accepted and how to go about writing them. The advice given is that of a software publisher as Harding knows the business inside out. He has been in it six years as director of a software house. The first section of the book describes the industry, how it has grown and the type of people who are involved in it. It covers mostly the upper, business, end of the market but the innovations shown by Tandy and Commodore are equally true of the smaller outfits attached to the home market. Harding explains that professional authors write for chips and not for specific machines. In that way, one program can be adapted for a wide variety of micros which contain the same chip. For instance, a game written for the 6502 could be easily run on the BBC Micro and the Commodore range of machines. A Z80 game could be transported across a wide variety of machines including Spectrum and Colour Genie. The next section, choosing a subject, expands on the theme of machine popularity. Harding lists the types of programs which companies will accept and stresses that you should pick companies carefully. Programs on the list include arcade, adventure, board, utility and simple account software. Each category has a section to itself in which the author explains the area and the pitfalls involved in it. He defines an adventure as a puzzle in which "certain actions have to be carried out in a chronological order". Harding goes on to explore some of the aspects which should be incorporated in adventures, such as syntax decoders, and how they have been used in famous programs such as those written by Scott Adams. It is a change to find an author who talks about software writing as a business and not as an art form. His message is clear. Good software makes big bucks. Creativity is a consideration, but as in any other business money has to be a prime concern or you will be bankrupt before your first program has been accepted. Harding's reasons for writing such a book, to help programmers get the most out of publishers when he runs such a company, might be regarded as suspect. The reverse is true, however, for two reasons. Publishers will welcome the book because it shows programmers what a company requires for a quick turnover of material. Gone will be the days of endless dross sent through the post on bad-quality tape or as listings. For the programmer the book provides all the answers. It might deter some from writing software but those are likely to be the ones who demand attention for their masterpieces which are sent in as miles of computer printer listing. As the book says, computers mean business. WHEN the QL sales finally take off there will no doubt be people buying the machine who have no previous experience with computers. 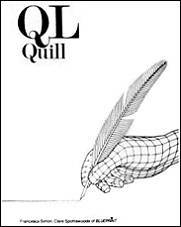 For that reason the two books QL Quill and QL Easel are a comprehensive guide to their operation. QL Quill was written by Clare Spottiswoode and Francesca Simon. The former has had a great deal of experience with both mainframes and micros. Francesca Simon, as arts journalist for the Sunday Times, has expertise in writing for a non-computerate audience. It is that combination which is responsible for the jargon-free nature of the book, which takes you step by step through the operation of Quill, the word processing program for the QL. The book is well laid out with ample explanation of each new concept. Besides that each new task is tied in to the story of Harold and Joyce Blake, their daughter Miranda, and her besotted admirer Nigel Wooton. Cartoons, from Derek Alder of the Sunday Times liven up the text. Whether you like or loathe the family concerned, the tale of Harold, a soft toy manufacturer, and Joyce, setting up her jewellery business, provide adequate examples of the uses of Quill in a business. The book not only teaches you how to use the program, but also contains a great deal of sound business advice. An example of that is Joyce's action plan for Jada Jewellery which contains all the necessary ingredients for preliminary action before starting a new trading venture. One tiny quibble comes at the beginning, when you are warned "Don't ever plug in a monitor when the computer is switched on, or you could blow your system." That is not in bold characters but lost in the text which preambles setting up the computer. There is also an error in the instructions for Search and Replace. If you follow the book the procedure does not work; simply follow the screen instructions instead. QL Easel, written by Alison Spottiswoode, who is as well qualified as her sister in the micro field, is written in a similar vein. There are more examples based on Harold and Joyce. The power of the program is readily accessible, and by illustrating that power the author has made it extremely easy for the business user to understand the usefulness of graphic interpretations of business figures.